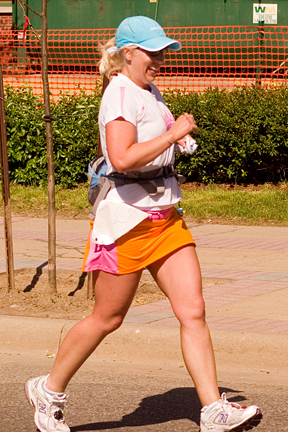 Zoomylicious: 2007 Riverbank Run 25k -- aka Run, Mommy, Run! Congrats!!! Am so happy to hear you had such an amazing experience!!!! Am really impressed you were able to eat a rice krispie treat though...no way I could do that without becoming horrendously ill. It is all I can manage to eat a piece of dry multi-grain toast before I run and can never eat for a couple hours after! 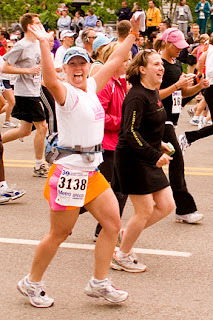 You know, I don't know that I'd take a Rice Krispy treat during a race, again. They really hit the spot during a long, relaxed training run, but during a race GU packets seem to go down better. I didn't have any sort of stomach upset, but I wasn't really all that hungry. On long runs I get ravenous, though.